Click-to-Pay is an exciting new capability that lets you include an online payment link in emailed invoices. Parents just click the hyperlink to make an online payment. Their payment information is processed in real time and sent to your bank account, and the payment data can then be quickly and easily downloaded into your EZ-CARE ledger! Click-to-Pay uses EZ-CARE’s standard features for emailing invoices in combination with an online payment form (which can be customized with your logo) created using our Online Forms. The emailed invoice includes a “smart link” that not only takes the parent to your online payment form, but also pre-populates the form with necessary family information (parent name, amount due, address, etc.). The parent just needs to confirm that the information is correct, enter their payment account information, and they’re done. 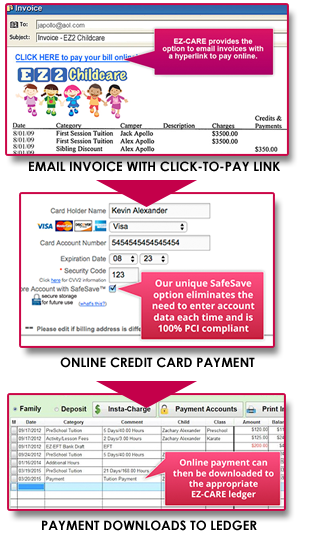 The payment form provides secure, real-time validation and authorization of the credit card information. All payments are then automatically deposited into your designated bank account, and a simple download posts the payments to the appropriate family ledger – with absolutely no data entry! Receive money more quickly – funds usually deposited within 24 hrs. No. The WebLink payment form is hosted on our secure servers so no web site is required. What email systems will it work with? Currently, EZ-CARE integrates with Outlook or Outlook Express to generate emailed invoices. We have integrated and partnered with a leading credit card processor who can provide the necessary online merchant account for organizations that wish to process credit cards. Integrating with other processors is not an option. However, organizations that already offer online payment with other online forms can use the same merchant account. The service operates on a secure server and complies with Visa/MasterCard regulations for real-time credit card processing. Yes, Click-to-Pay supports both eChecks and payments made using debit cards. Call (800) 220-4111 to speak to your account manager, receive a demonstration of Click-to-Pay and get answers to all your questions.